I love when I have the opportunity to photograph weddings of people I know. I have known Emily since she was in high school (I did her prom pictures!) and when she called me last year to ask me to shoot her wedding I was thrilled. I was even more excited when I found out her wedding venue was Peacock Ridge. Peacock Ridge has the most amazing backdrop for sunsets and we were able to get some "golden hour" photos that I adore! They really worked hard to make their wedding special and unique to them. I loved that their fathers preformed the music for their First Dance. Emily's father played the keyboard and Broc's father sang and played the guitar. Beautiful! 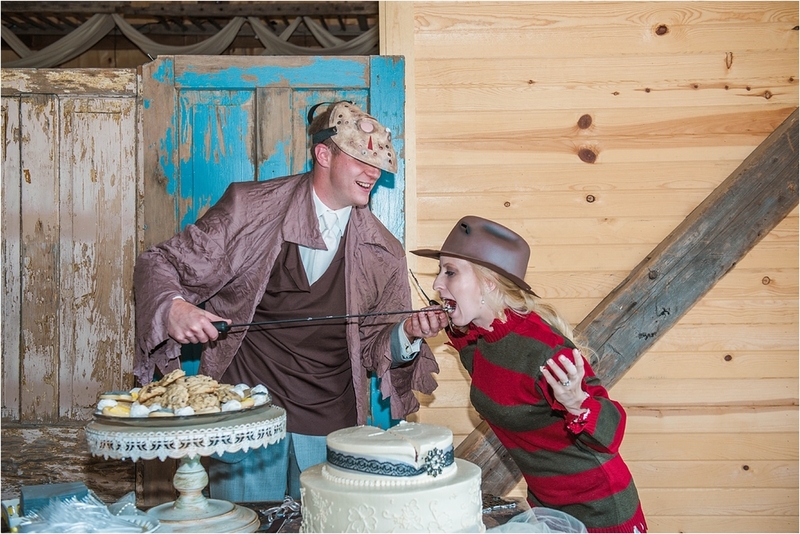 One hilarious part of the evening was when the Bride and Groom dressed up as Freddy Krueger and "Jason" for the cutting of the cake. I'm sure guests won't soon forget seeing Freddy and Jason cut the cake with a machete and a super-sized claw! Emily and Broc have such a great family and group of friends who made the day full of laughter and wonderful memories. It was my privilege to be a part of their wedding day!